This Society of Bell Ringers regularly ring the bells for services at St. Mary's Church in the village. On Monday 13th October, 2014 The Reverend Susan Bowden-Pickstock was inducted and instituted, at St. Mary's Old Hunstanton, as Rector in the Saxon Shore Benefice. On Wednesday 15th October, 2014 a Quarter Peal of 1,260 changes of Plain Bob Doubles was rung at St. Mary's, Holme-next-the-Sea to mark the occasion and to welcome Susan to the parish. When the new Rector took her first Service at this parish Church, and just before the start of the Service, the Tower Captain, Tony Foster, presented Susan with a framed certificate showing the details of the quarter peal rung in her honour. Bell ringing is known by a variety of names - "church bell ringing", "full circle ringing" "change ringing" and even "campanology" - although we tend to think of ourselves as bell ringers rather than campanologists (who are more concerned with the study and science of the bells). During the last few years the number of ringers at Holme-next-the-Sea has fallen but in 2007 we were fortunate that two from Heacham joined us, followed a year later by another ringer from Heacham so we can still manage to ring the five bells for most services and for all of those occasions when ringing has been requested. 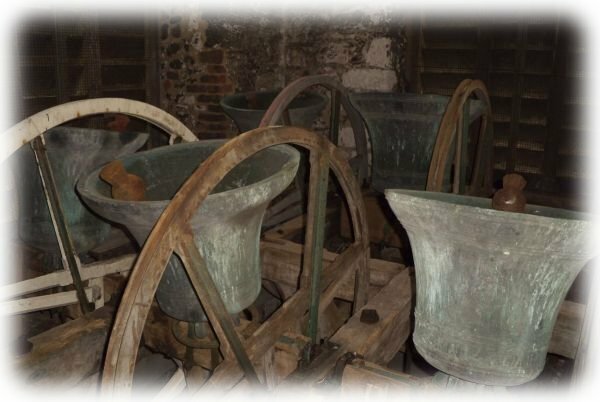 The bells have joyfully announced weddings, rung solemnly and half-muffled for funerals and have rung to mark special occasions including H.M. The Queen's 80th birthday, the 200th Anniversary of	Admiral Lord Nelson's Victory at Trafalgar and the 60th Anniversary of the end of World War Two. 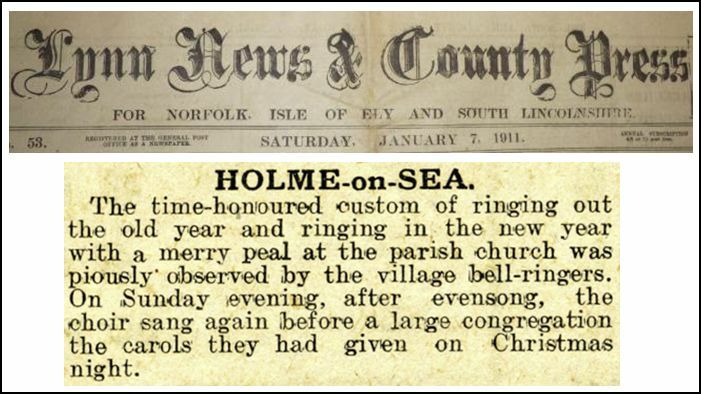 Here is an old newspaper cutting showing that the bells in this church were ringing in the New Year 100 years ago! 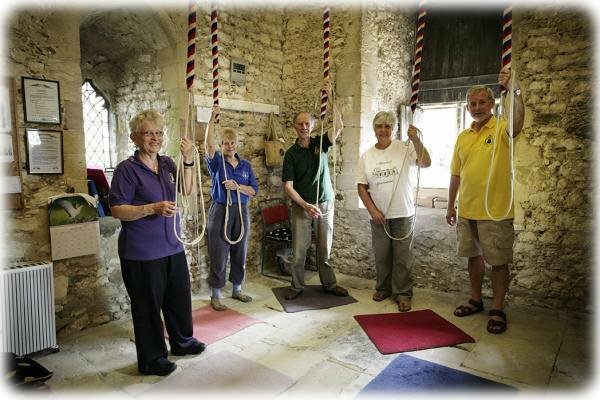 We welcome new members and are always pleased to see new ringers including those with experience and newcomers wishing to learn The Exercise. The Church bells are used to announce that a service will soon be starting. The bells can also be rung for weddings - we usually ring for about 30 minutes before the wedding with a few minutes break. The bells ring constantly from about 10 minutes before the bride is due to arrive and will stop as she enters the Church. They start ringing once again as the married couple leave the Church and will continue for up to 15 minutes. The charge is in line with the rates suggested by the Central Council of Bellringers and the Norwich Diocesan Association of Ringers and is currently £15 per bell. As there are five bells at St. Mary's the charge for a wedding is £75. One third of this amount goes towards keeping the bells and fittings in good working order. The bells can also be rung for funerals. They can be rung 'open' - normal ringing. Or they can be 'half-muffled' which results in alternate rows of soft and normal notes. This sounds very melancholy which many people find quite moving at such a sad time. If required, the largest bell can be half-muffled and rung alone. There is no charge for ringing for funerals or memorial services. To book the bells or for further information please contact Tony on 01485 525149 - early booking well before the event is strongly advised. Please also visit the bell ringers' web site at www.hntsbellringers.co.uk.